After Britannia Bourbon Biscuit offer paytm again bang with a new offer. now get Free Rs. 10 or Rs. 20 PayTm Cash with Kitkat Rs. 10 or Rs. 20 Pack. this is a limited period offer and A single user account can avail the offer thrice. 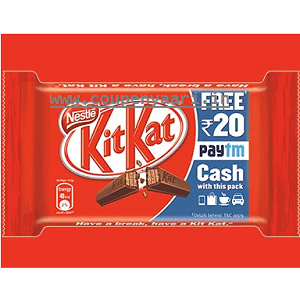 Participation in this Promotion namely, Paytm Kit Kat Offer (“Offer”) is purely voluntary and optional. This Offer is not valid in conjunction with any other Offer. Products also available without this Offer. By participating in this Offer, each participant is deemed to have accepted these terms and conditions. On successful application of the Code a onetime addition of respective denomination (Rs 10 or Rs 20) to user’s Paytm wallet will be added. Each code is unique and can be used once. A single user account can avail the offer thrice. The coupons would be valid till 30th April 2016. User would not be able to avail the offer after that. Buy Kit Kat chocolate-covered wafer biscuit bar. Enter your cash code from Kit Kat chocolate-covered wafer biscuit bar pack and Click Proceed.